Up until a couple of months ago, I had no idea that keeping fish was such an emotionally draining experience – or that it would involve such a large chunk of every weekend. Gone are the days when goldfish were given out in sandwich bags at the local fair. Now it’s all swanky tanks with fitted pumps, fancy (a.k.a pricey) breeds and a bigger assortment of cleaning paraphernalia than currently resides under my kitchen sink. And don’t get me started on the paperwork. I do believe there’s more legal documentation to fill in when purchasing a fish than there is to bring a human child into the world. When buying one itty-bitty little fish, I was quizzed on the size of the tank, how many other fish resided in it, how many plants were in situ and how well-established and stable the living environment would be for the new arrival. When I left the hospital with my new-born babies, I don’t recall needing proof of anything other than a car seat. No one asked me whether I had a safe, secure and child-friendly environment to return to, or how many other mouths there were to feed and whether could I afford to maintain another. It says much about society today I think when you need to prove you’re a responsible adult to purchase a fish, but any half-baked, under-age moron can pop out a child. Anyway, back to the drama of keeping fish. My first experience back in the 80’s was a relatively stress-free affair. It consisted of a plastic fish tank, a few bit of coral and Dempsey and Makepeace (Versions 1, 2 and 3). The only drama that I can recall is the day Dempsey 2 leapt out of the tank and landed between the pages of a nearby book. Which promptly slammed shut. After much searching, many tears and shrieking accusations of theft (aimed at my sister), Dempsey 2 was later found – ever so slightly flattened – and returned to the tank. He struggled on for a few more hours, swimming in ever decreasing circles before finally gasping his last breath. A few tears later and he was given the customary sendoff. He was flushed and then quickly replaced. Yes, it’s a brutal life being a fish. A coupe of years ago it was decided my daughter was ready to have her own fishy friend, and so, amidst great excitement, she was taken along to choose two new members of the family. If I’m honest I didn’t hold out much hope for the long-term survival of Hermione (that’s her on the right) and Ron. On some days they were starved and on others massively overfed; often they could barely see through the glass (I swear I once saw Ron trying to wipe it with his fin) and often the filter was turned off at night as it proved too noisy for a goodnight sleep. But what do you know, despite being moved from house to house in 2 inches of water and continually having their tank covered with dustsheets while we renovated and painted around them, they held in there and are still going strong. 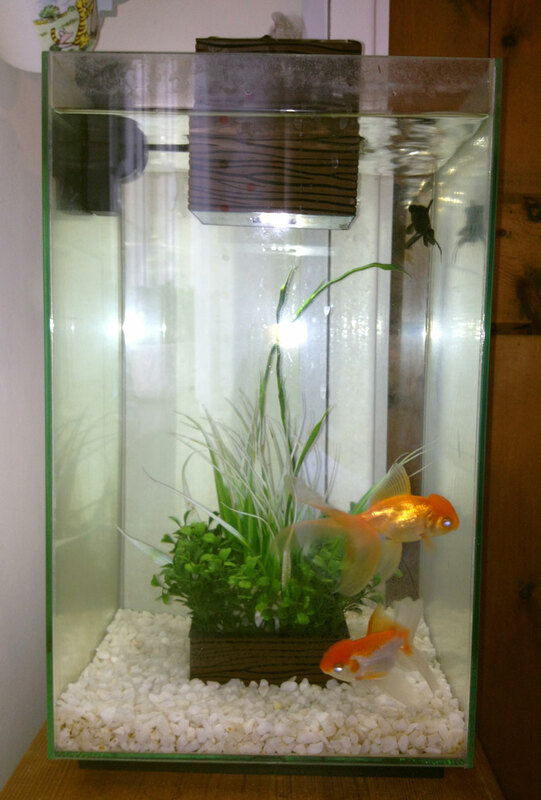 With them now taking up residence in the kitchen, it was decided that the ‘Nemo’ themed tank (complete with glass pebbles and a garish grinning plastic fish) was quite frankly hideous – and now resembling something akin to a limescale encrusted swamp – and it was definitely time to move Hermione and Ron up the property ladder and into a bigger home. Preferably one with a classier line of décor and uninterrupted views of kitchen life. An open-topped Fluval Chi tank was duly bought and installed. With its neutral colour scheme and bubbling waterfall feature it was certainly an improvement. I think the design is meant to improve the Feng Shui of our home, though from my limited knowledge of the subject I’m fairly certain that having a large collection of razor-sharp knives stuck to the opposite wall might just have cancelled out any benefits gained. As Hermione and Ron were more than happy with their new abode, it seemed only fair that my son should have his own fish too. So back we went to Pets at Home and, using his Easter money from Grandma, he selected Voldemort. Now he had seemed like quite a perky little fish in the shop, but sadly it was just not meant to be. Just one week later and we came home to find him floating upside down. I did try to keep my son from spotting him, but I wasn’t quite quick enough. And so followed the inevitable tears, explanation of death and reassurance that he must have already been sick – as opposed to my sons deeply held belief that the other two had ganged up on him and cruelly starved him to death. So back to the shop we went (dead fish and receipt in hand) and Voldemort 2 was promptly chosen. We also decided to throw caution to the wind and purchase a couple of shrimps to join the crew, in the hope they could make themselves useful and keep on top of the additional poo. Another week went past and we noticed that Voldemort 2 was now spending the majority of his days bobbing around at the surface. As try as he might he simply couldn’t swim down, and every time he did he immediately shot up again and then lolled against the side of the tank. So once again – given that we obviously had nothing better to do with our weekends – we loaded the fish into a plastic yogurt pot, prepared his owner for a second consecutive loss and headed back to Pets at Home. Feeling rather embarrassed to be working our way through their stock so fast, we handed over the now motionless fish for a diagnosis. Well it turns out Voldemort 2 wasn’t at death’s door after all, he was merely constipated. Who knew? There was us about to flush the little bugger down the toilet and all he needed was to relieve the load. It certainly explained the bobbing to the surface and all that rolling around with a pained look on his face – he was basically puffed up with wind. 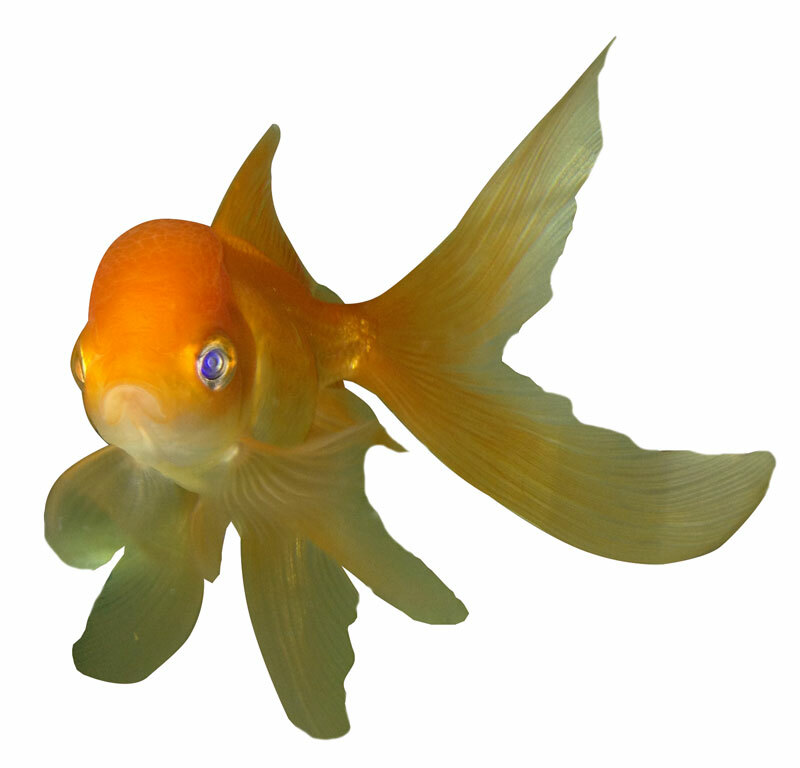 The solution to a gassy goldfish – should you be interested – is all in the diet. Too many flakes will do this to a fish apparently. So we returned to the car and happily informed our waiting son that his fishy friend had indeed returned from the dead. He declared that Voldemort 2 had obviously used his superior magic powers to survive a vicious and attack from Hermione and Ron. I’m pleased to say that one block of blood worms later and Voldemort 2 was several ounces lighter and capable of swimming down; he’s never looked back since. Sadly the same can not be said for the shrimp. The very same week we realised that both had vanished without trace. It was confirmed in the pet shop (a place I was by now quite clearly spending far too much of my time) that shrimp like to leap, and had therefore quite possibly ended up on the kitchen floor – and as a doggy hors d’oeuvre. It goes without saying their cost was refunded. Well, they were pricey little things to start with and the sales girl (so we were told) should have never have released them to such a certain death. Low and behold, when cleaning the tank a few weeks later both shrimp were spotted alive and kicking. They’d simply been hiding away in the fake plant and obviously so consumed with their designated job as toilet attendants, they hadn’t even had a chance to come up for a breath. I’d like to say that brings the whole story to a nice happy end. But alas, in this death trap of a house it wasn’t to be. While I getting ready for work just one week later, my daughter brought up the empty pot that sat on the floor beside the tank. And there, curled up in the bottom was one crispy kamikaze shrimp. The whereabouts of the other one remained something of a mystery right up until the day I decided to wash the sofa covers. Upon pulling the 4-seater away from the wall, what should I see on the floor but the missing scuttling critter. Quite how he had summoned up the energy to leap from the tank in the kitchen, make it into the living room, across a deep pile rug and behind all that heavy sofa fabric I have absolutely no idea. Perhaps the dog was in hot pursuit at the time. I’m pleased to report that to date, all 3 surviving members of the fish tank are still alive, happy and completely intact. The blood worms (given on alternate days with flakes and pellets) are keeping them regular and none are showing any suicidal tendencies or even attempting an escape. I once found one of our shrimps in the tumble drier. Yes! Finally something about fubar.